Emerging technologies such as AI will soon change the world as we know it. Life has become strange recently. On the world stage all the talk is about building boundaries, walls and restricting trade. Yet in business, we’re still discussing the benefits of breaking down barriers, integrating siloed information, open systems and global markets. We’re even experiencing an end to the traditional 9 am to 5 pm office day as a more and more opt to work remotely. In other words, conventional restrictions are being smashed and the momentum is so strong that it’s hard to imagine it won’t continue to grow. But then who knows? As we have learnt over the past few years, anything can happen and businesses need to be prepared for a potential bumpy ride. But the difference now, to whenever this has happened previously is that advances in analytics and artificial intelligence (AI) means better-informed decisions leading to less risk-taking. According to Salesforce, despite all the data we are currently creating, less than 1% is currently analysed and half of all business decisions are made with incomplete information. But perhaps the main step change is not that AI, for example, exists at all – after all it’s been backbone of science fiction for decades. The leap is that it’s now accessible to smaller businesses, providing tools that don’t just pull information out of data, but push information to you, anticipating what you are going to want to know. 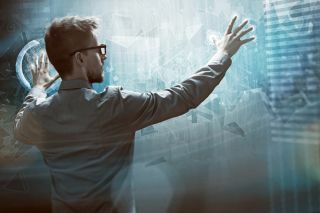 Most business data sits in a maze of internal and external systems and a mix of cloud and on-premise systems which don’t communicate, leading to siloed data,questionable data quality and a missed opportunity to connect with customers. Cloud-based CRM solutions are designed to connect all of that data to create a single view of each individual customer. This connected approach to data is essential to optimise the AI opportunity. Unanalysed, unused data is worthless. So data sitting in these silos is no good to anybody. But neither is data that nobody can analyse or make meaningful in any way. Data scientists are like gold dust and can ask for their weight in gold accordingly. But today’s new AI tools are making it possible for businesses to work without them, although I don’t think they’ll be taking a pay cut soon. The best new platforms offer native data preparation, saving time and resources by eliminating the need for ETL. Previously the kind of computing system needed to run machine-learning algorithms would have been prohibitive for small businesses to buy. However, cloud computing has made this computing power more accessible and affordable. Until recently, AI was something that existed in books and in films – nothing to do with business. And yet why are the tech giants all developing their own form of AI – for example Salesforce and Einstein, IBM and Watson? Because they see the huge potential, of course. But how does AI differ from just analysing data? Algorithms adapt to data, developing behaviours not programmed in advance, but learning to read and recognise context. Inherent in this is the ability to make predictions about future behaviour to know the customer more closely and to be proactive rather than reactive. And how does it work in practice? For example, a manufacturer may be thinking of increasing production – instead of just shouldering the risk, increasingly they will have metrics and predictive data to tell them whether or not this is a good idea. On the sales front, reps can be ‘pushed’ proactive information on their day ahead on a smartphone or tablet. Key customer meetings are organised in priority of opportunity value and along with each of their top three pain points plus practical information such as directions to a customer site (which is also pre-programmed into the rep’s sat nav). This information is dynamic; for example, suddenly there is a notification; a top customer has just made an important acquisition. Automatically the rep is sent the top trending news articles on the topic with product recommendations that integrate with the acquisition. Meeting notes are uploaded and the system automatically extracts action items and suggests next best actions. Customer service will be transformed as AI begins to anticipate customer needs rather than reacting to them. For example, instead of the customer tracking the progress of an order, an AI-enabled CRM system will be monitoring and will notify the customer that a package is delayed and letting them know when it will be available and perhaps offering some kind of ‘sweetener’ such as a special offer to soften the blow. This kind of proactive service also enables businesses to identify customers who are at risk of churn and take remedial action immediately. Marketers will have access to a new level of precision and personalisation and use of AI will give rise to predictive intelligence enabling the segmentation of audiences based on likely future actions and a tailored journey for each individual customer. There’s little doubt that the impact of AI for business will be pervasive and cover many areas including sales, service, marketing, manufacturing and even IT where it can be used to build smarter, predictive apps faster. Salesforce may be the first of the big names to consolidate all their acquisitions and bring the results to market but the software is still evolving and will, no doubt continue to do so. Salesforce partners have a huge role to play here in working with customers to first show them that AI will complement their skills to help them work and act smarter and then help them implement the technology in the best way for their organisation. It’s not surprising that some organisations are wary: the business world has been battered by successive waves of new technologies over the past few years. But perhaps taking the risk now, may lead to fewer risks in the years to come.